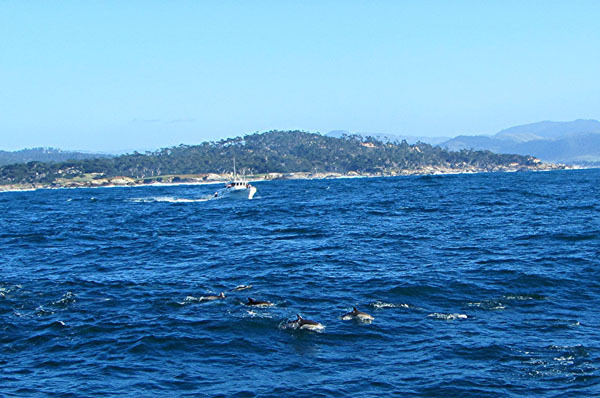 Last weekend, I went to Monterey, California. I'd been there once before and remembered going to see Fisherman's Wharf. 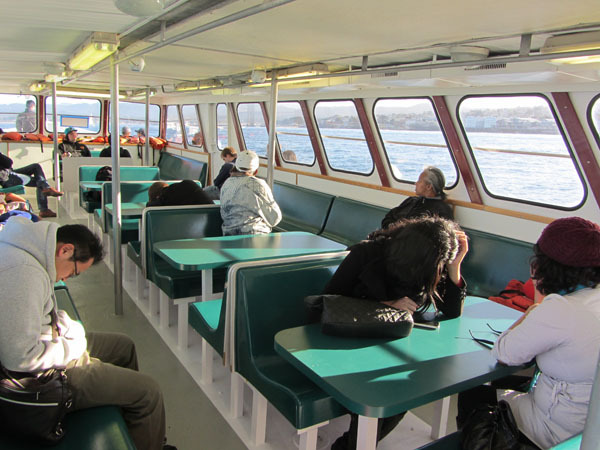 I vowed that if I ever came back again, I would take one of the whale watching tours that launched from the piers. So I did it. 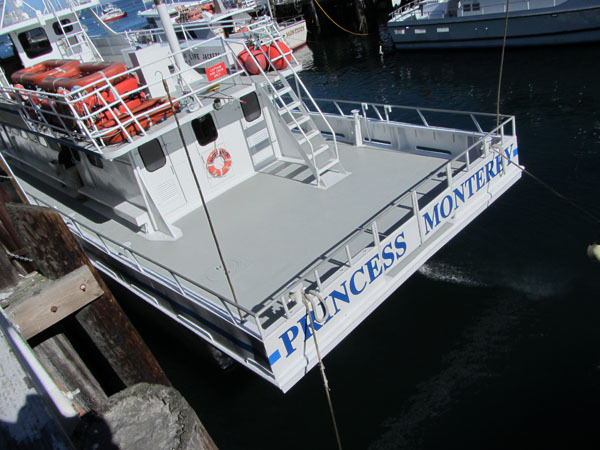 I'd heard good things about the Princess Monterey tours and found out that tickets for the three hour adventure were only $40.00. I found that to be an incredible bargain considering all of the awesome wildlife we saw while on their tour. I liked it so much as a matter of fact, that I went two times and enjoyed the second trip just as much as the first! On Saturday, I was accompanied by my co-worker, Jeff, and his lovely friend, Diana. This was my first time meeting her and I knew we'd hit it off when she tolerated my renditions of Michael Jackson's Dirty Diana and John Cougar's Jack and Diane. If a lady can handle my singing then she's all right in my book! 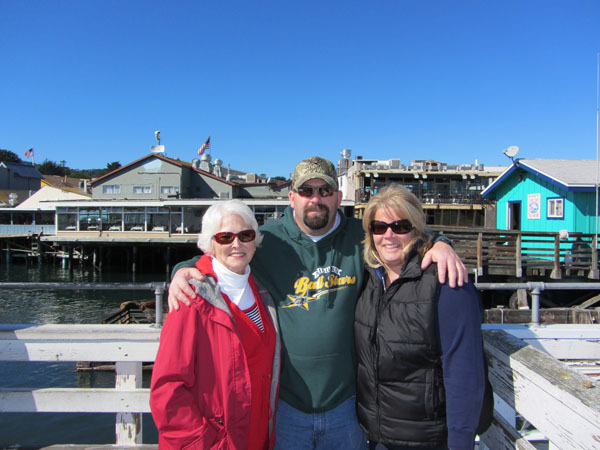 On Monday's trip, I was joined by my step-mom, Joyce. 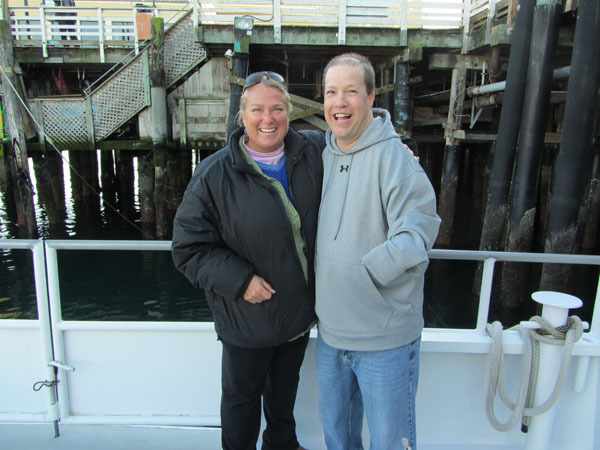 Lori and Dave came along to visit me, but declined going on the boat because she'd had a bad experience in the past. The water can be really rough and difficult to tolerate as we discovered on Saturday. Monday's ride was gorgeous, but Saturday's was pretty rough. 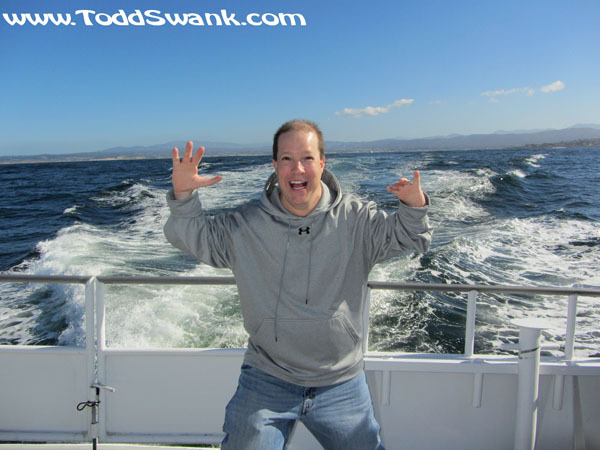 Some of the waves were taller than the boat and we were rollicking up and down for three hours straight. By the end of the ride, there were many people inside the cabin looking pretty sick. None of my crew tossed chunks over the railing, but we all had pretty nasty stomachs before we got back to dry land. Not everybody was sick, though. 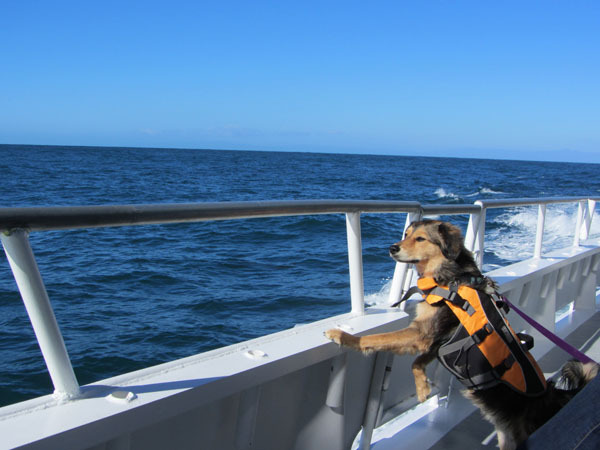 This dog was pretty consistent in his request to "Bring on the Damned Whales!" Our guide for the tour was awesome! 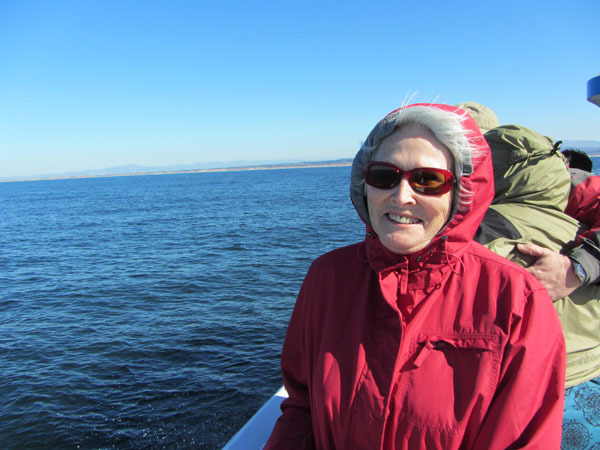 She has been a marine biologist for a long time and seemed to have an endless amount of tales about the amazing sea life we were encountering. She told us about the migration patterns of the whales. She said that Orcas were the smartest creatures in the sea and there were pods of them nearby that were known to hunt great white sharks. I could listen to this lady all day! She later told me that she'd just come back from being far out at sea for more than 27 days!! I told her I really admired her work and thought her lifestyle seemed incredible!! I doubt I could handle it, but must admit that following these incredible animals around the planet does sound like a pretty cool way to live! Although the life of a sea lion doesn't sound too bad either. Except for that whole being chased by orcas and great white sharks thing. They told us the bay is really becoming overpopulated with these animals. Because they are a protected species, people can't harass them, touch them, or feed them. Therefore, they pretty much get to do whatever they want, wherever they want. And judging by the smell when we sailed by their little set of rocks out here, they do that very thing. 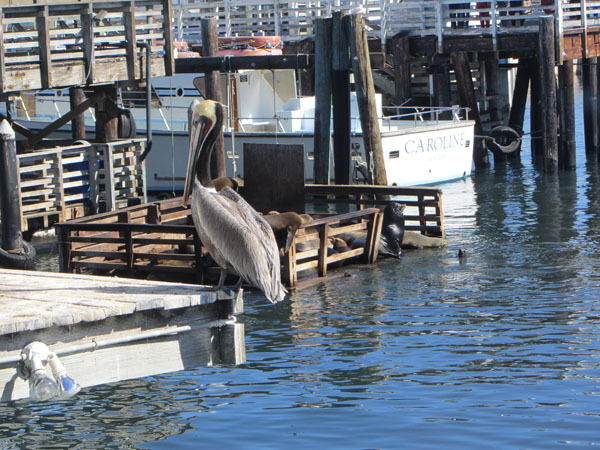 I don't know if the pelicans are also protected, but watching this guy poop into the water during lunch made me think they sure act like they're protected! 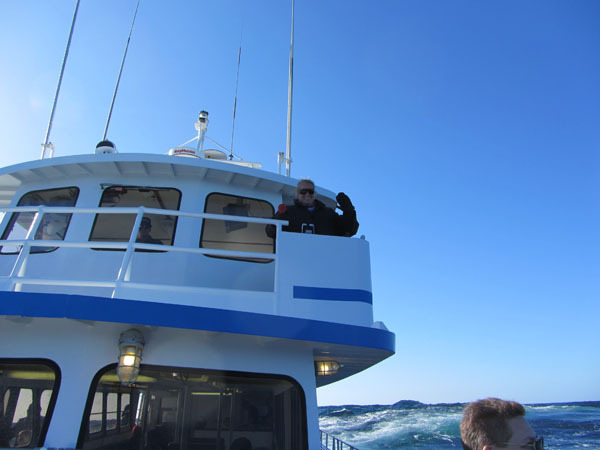 We got all bundled up and prepared ourselves to go out and see some whales!!! 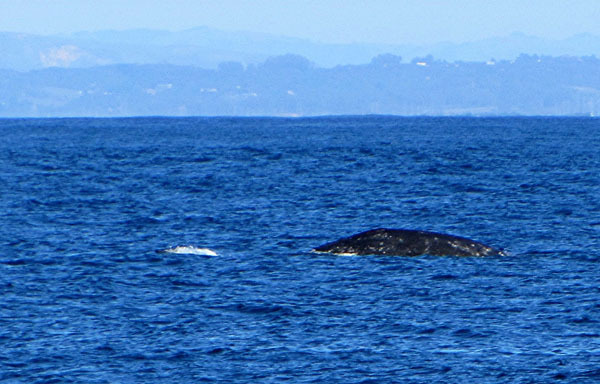 During both of my tours, we saw gray whales pretty regularly. We quickly learned that you need to watch for the spray and then shortly afterwards, you'd see their backs hit the surface. 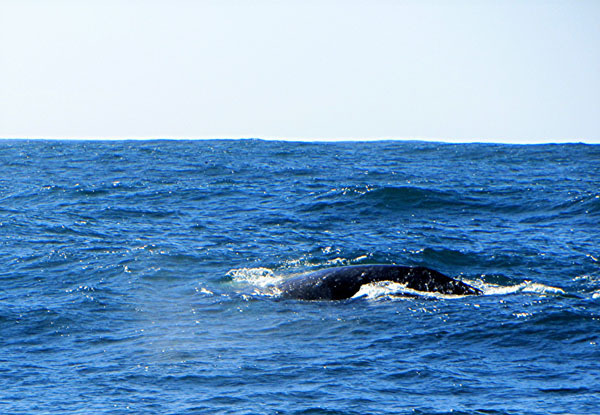 I was a little underwhelmed at first because I guess I was expecting to have the chance to see more of the whales. But I guess it's against the law to try to lift them out of the water so I could get better pictures. 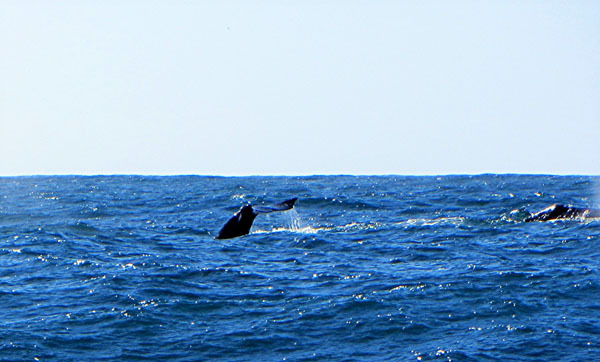 It actually proved to be quite challenging to get pictures of the whales. The ocean is pretty big and these guys don't exactly sit still. So I just kept clicking away and hoped for the best. I was pretty happy with some of my shots, but still would have loved to see one of these beasts actually jump out of the water. Seeing a little tail was the best I could do. When going through my photos, I noticed the fin sticking out of the water on the left side of this one. 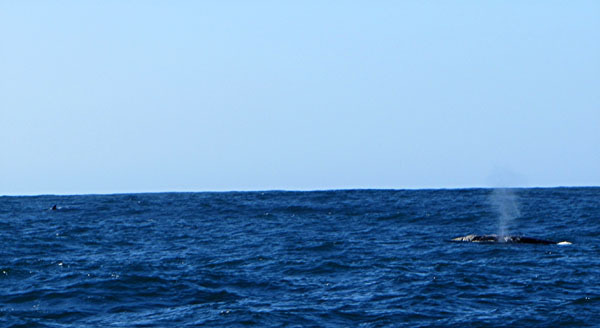 Although I didn't see it at the time, I'd like to think that maybe this was an Orca or great white shark. 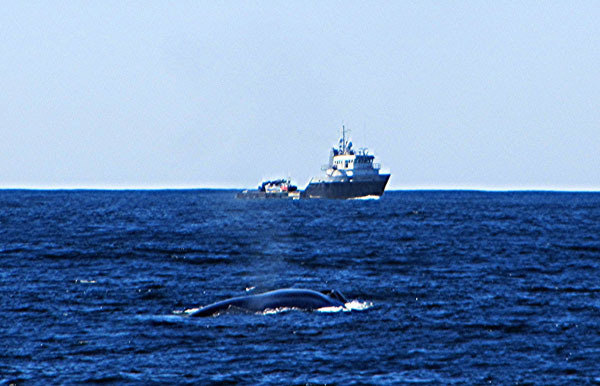 Although, I'm sure it was just another gray whale. 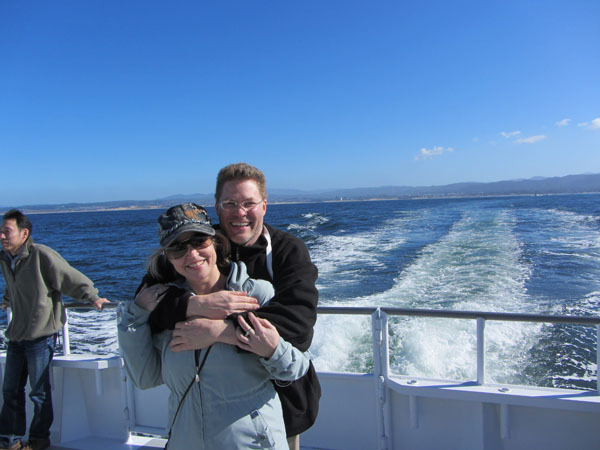 Apparently, the gray whales usually travel with a companion which is nice so they don't get lonely. That ocean has to get boring after awhile, so a friend is nice to have to help pass the time. 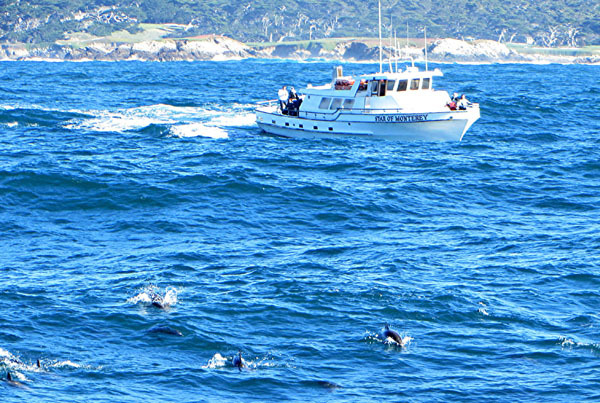 We also had the chance to see a huge pod of dolphins coming right at us! 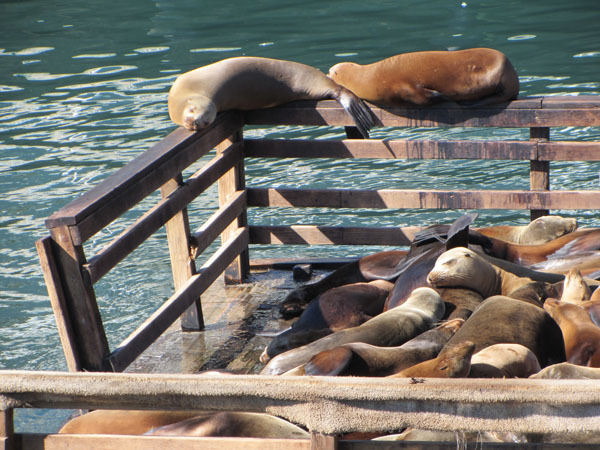 The guide said they're usually skittish and avoid the boats, but I thought this group got pretty close to us. I wasn't able to get photos of a lot of the dolphins at once, but there had to be at least 100 in this pod. It looked like they were having a big race of some sort, but I have no idea how they can judge who's the winner. 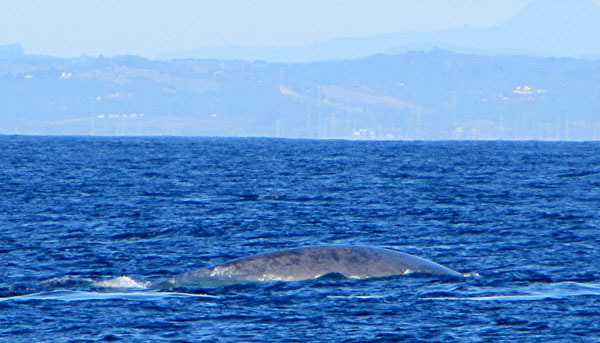 We were told we were going to have a very special treat on Saturday when we suddenly came across a blue whale. They said this is the largest creature that earth has ever seen and a full sized adult was the equivalent size of 30 elephants! All I could think of just how much fun it must be to ride one of these bad boys! 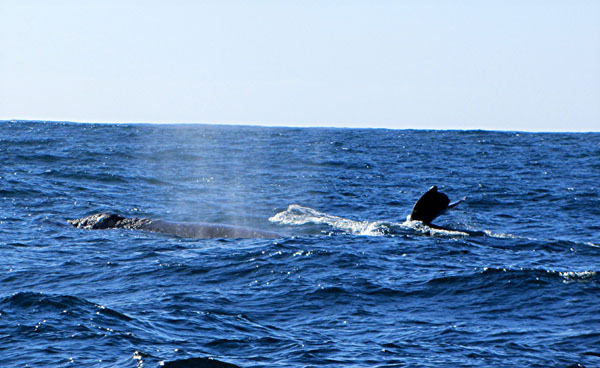 On Monday, we stumbled across a group of three blue whales and spent most of our trip tracking them. 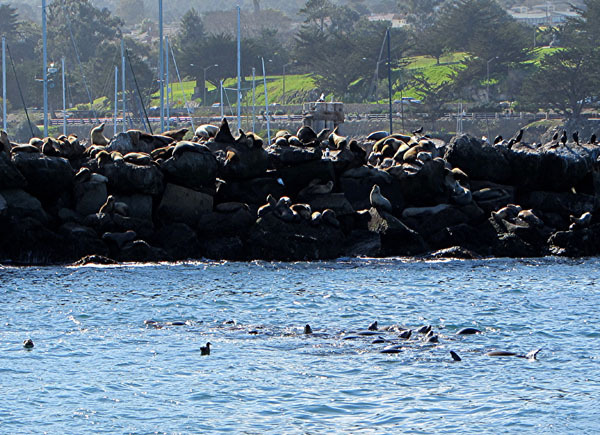 The guide said that normally it's considered early if these animals show up in the Monterey Bay in May, so they really have no explanation why a large group of them have started appearing there in February. I'm sure glad they did, though. It was such a special opportunity to get to spend some time with them! I've never really considered myself much of an environmentalist before, but I sure gained an appreciation for these amazing whales while I was there. It's hard to believe that in some parts of the world they are still being hunted and slaughtered. They don't seem to fear man at all and one can see just how vulnerable they'd be to somebody who wished to cause them harm. 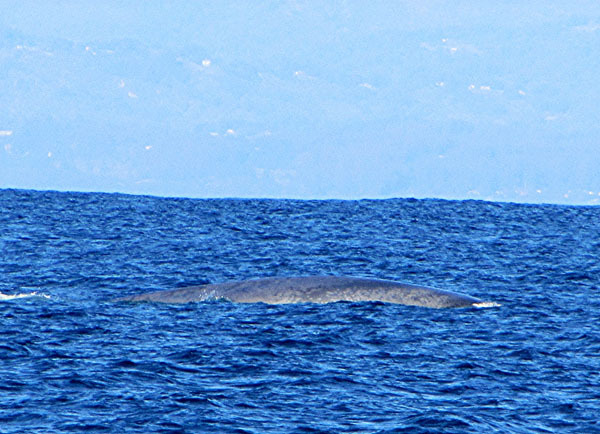 The guide told us it was estimated that at one point, there were more than 300,000 blue whales in the world, but now there's thought to be less than 10,000. I certainly hope that trend reverses, because I'd sure like to see these guys again some day!